Jan. 25, 2017 | 2 p.m. The crisis in Syria has put new focus on refugees in the United States. But when it comes to where people who flee conflict and persecution around the world have resettled in the U.S., Wisconsin lands about in the middle of the pack. Between 2002 and 2016, 13,671 refugees resettled in Wisconsin, records from the U.S. Department of State show. That number places Wisconsin 24th in a ranking of 54 U.S. states and territories. By comparison, 16 have become the home for more than 20,000 new refugees each, with large states like California (102,885) and Texas (81,928) unsurprisingly topping the list. Refugees — a population distinct from other immigrants — make up a varied segment of Wisconsin's population. But under current law, state governments don't have any direct say in refugee resettlement in the U.S. Rather, the United Nations, the federal government and a network of nonprofit resettlement agencies have made all the big decisions. As structured in recent years, the resettlement process itself is extensive, beginning with the U.N. The U.N. High Commissioner for Refugees works to assist people displaced from their home country and assess whether they're potential candidates for resettlement. Refugees register with the UNHCR, which examines each application in a complex decision-making process to determine who meets the criteria for needing resettlement. This initial step narrows the pool significantly. Among the "refugees of concern to UNHCR around the world, less than one per cent [are] submitted for resettlement," states the agency. Applicants who meet the U.N.'s criteria are then referred to one of the nations that accepts refugees. If that nation is the U.S., the State Department's Bureau of Population, Refugees and Migration has been responsible for coordinating the next steps through the U.S. Refugee Admissions Program. One of nine Resettlement Support Centers around the world, jointly operated by State Department with five international and nongovernmental organizations, have been charged with helping refugee candidates gather needed documentation, check the details of their applications and pull together other information required for a security check. In turn, multiple federal agencies, including the Federal Bureau of Investigation and Department of Homeland Security, interview candidates and conduct additional screening, like scanning fingerprints and checking them against biometric databases. Candidates also receive a medical check through the Department of Health and Human Services. After passing these steps, the State Department has worked with U.S.-based resettlement agencies and their state-level and local chapters around the country to determine where a refugee should be placed and provide a range of services to help that person get on their feet in their new home. An Obama administration infographic from 2015 laid out this process in much of its dizzying detail — and noted additional screening steps in place for Syrian refugees. States have not been in the dark about this system. The Wisconsin Department of Children and Families is responsible for coordinating refugee services in the state and allocating funding to local affiliates of the national nonprofit agencies involved in the resettlement process. As PolitiFact noted when evaluating a misleading statement made by Gov. Scott Walker on the Dec. 23, 2016 edition of Wisconsin Public Television's Here And Now, information about the number of refugees in states and where they resettle is readily available. The State Department's Refugee Processing Center has been responsible for WRAPS — the Worldwide Refugee Admissions Processing System — that is used to track the resettlement of refugees in the U.S. This system provides data about where refugees have come from, and which states and cities they resettle in, stretching back to 2002. Over the past 15 years, refugees from 36 different countries have resettled in Wisconsin. The largest nation of origin by far has been Burma, also called Myanmar, from which people are fleeing an ongoing series of atrocities committed by the country's military-dominated government. Between 2002 and 2016, 5,265 refugees from Burma resettled in Wisconsin. 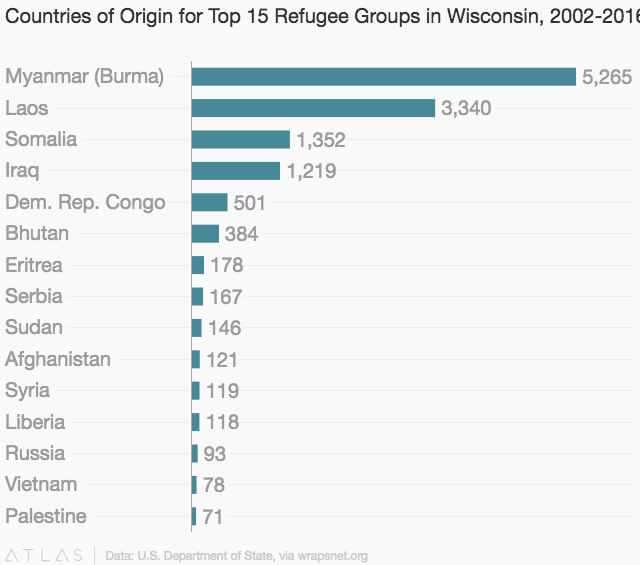 The second and third most common nations of origin for refugees resettling in Wisconsin are, respectively, Laos and Somalia. Both represent two of the Midwest's best-known refugee communities. A total of 3,340 people came from Laos over 2002-16. These people are primarily Hmong, who first started settling in Wisconsin in the mid-1970s. Another 1,352 people from Somalia settled in Wisconsin over this time period, forming a small satellite of Minnesota's larger Somali refugee community. Other nations supplying comparatively sizeable numbers of refugees to Wisconsin include Iraq, the Democratic Republic of Congo and Bhutan. Overall refugee resettlement in Wisconsin steadily increased over the past decade. The state saw a big spike in 2004, when 2,088 more Hmong people arrived from Laos — part of a group of 15,000 refugees admitted into the U. S. that year after languishing for decades at the Wat Tham Krabok refugee camp in Thailand. 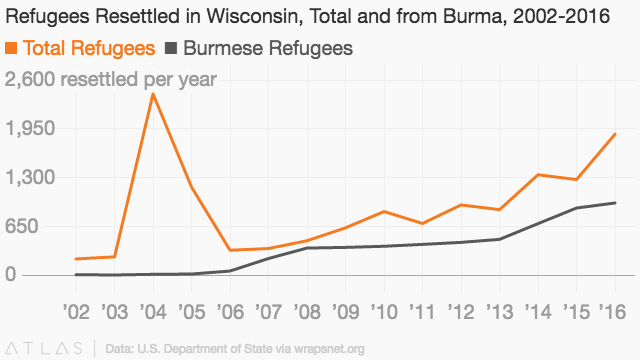 The number of refugees coming to Wisconsin from Burma has grown considerably since 2002. In most of the years since 2007, these refugees have made up at least half of the total number settling in the state. The vast majority of refugees in Wisconsin have settled in Milwaukee. But there are some unexpected patterns. Oshkosh has welcomed a few more refugees than much larger Madison. And among the state's largest cities, Kenosha, Racine and Waukesha have seen surprisingly few resettled refugees — 5, 18 and 79, respectively. Not surprisingly, resettled refugees tend to be concentrated near the agencies providing them with temporary assistance in starting a new life. In Wisconsin, virtually all those agencies, with the exception of some satellite offices, are based in Milwaukee, Madison, Green Bay, Oshkosh and Sheboygan. Oshkosh has been Wisconsin's second-biggest destination for refugees in recent years. Moreover, a refugee group already well-established in one city or state has tended to keep growing. Family-reunification goals through U.N. and U.S. agencies have played a role, as have efforts by resettlement officials to direct new arrivals towards communities that include some element of home. 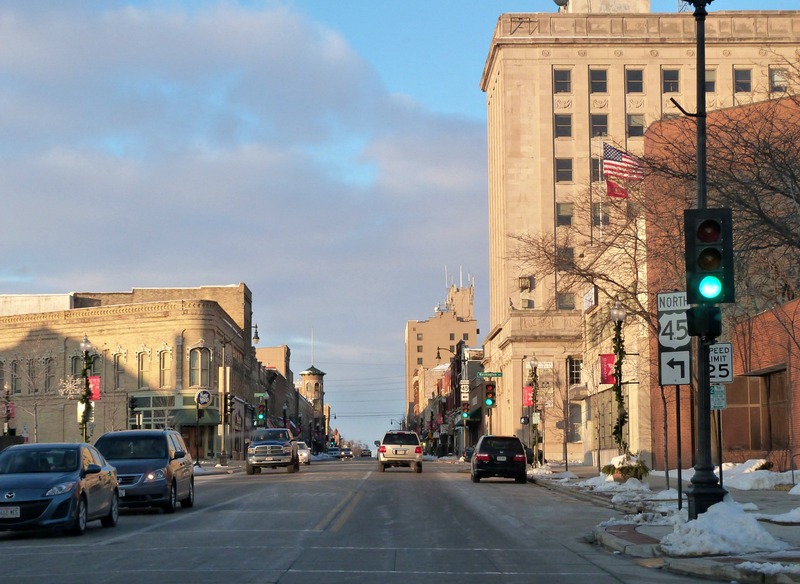 What about Syrian refugees in Wisconsin? Former President Barack Obama was adamant about welcoming more people fleeing Syria, and both President Donald Trump and Gov. Walker have focused their concerns on them in particular when discussing refugee resettlement. More than 15,000 refugees from Syria resettled in the U.S. in 2016 alone, but their presence in Wisconsin is tiny — 119 people arrived to the state from Syria between 2002 and 2016, and another 17 as of mid-January 2017. The Obama administration set a goal of admitting 110,000 refugees in fiscal year 2017, but that policy looks likely to be reversed. On Wednesday, Jan. 25, a draft executive order leaked from the Trump administration included plans to place a multi-month ban on resettling refugees in the U.S. Exceptions would be made for religious minorities fleeing persecution. As noted in the order, this ban may be lifted pending changes in the vetting process at the federal level, with additional language specifying limits on refugees from Syria. Additionally, a limit of 50,000 total refugees to be admitted would be set for fiscal year 2017. This draft order follows Trump's campaign statements proposing to register and/or ban Muslim refugees and immigrants. One day earlier, Sen. Ted Cruz, R-Texas, and Rep. Ted Poe, R-Texas, introduced a bill that would add a specific state government role in the refugee resettlement process. If Congress passes and Trump signs the bill, this policy would require the federal government to notify states about refugees approved for resettlement, and authorize governors to bar their placement.